At the point where Ao Wok Tum meets Laem Sri Thanu, the coral reef starts nearer the beach and the wide sand flats that dominate the coast further south become smaller; the swimming conditions improve dramatically on the west coast, and the coral rich area becomes a haven for marine life. The coastline also starts to break up, forming more coves and bays that isolate each beach and enhance the beauty of the landscapes. The beaches of Had Yao and Ao Chao Phao are said to be amongst the most idyllic and scenic on the island. This is one of the reasons why the west and sunset side of Koh Pha Ngan is such a popular destination on the island. The outstanding natural beauty of the area has drawn visitors since the first bungalow operations started twenty or so years ago. This has meant that there are many well-established family run resorts that have set the high quality of accommodation that exists in the region. There are resorts to suite every budget and taste, several have swimming pools, air con rooms and even wine lists alongside resorts with old skool Pha Ngan beach huts, unchanged in years yet still maintained in keeping with the areas high standards. There is also an extensive concrete road network that now makes it easy to access virtually any destination on the island from the west, most of the roads are flat, and the main village of Sri Thanu is only 10 minutes drive from Thong Sala. There are several waterfalls in the region and it is easily possible to beach hop up the coast by foot if you want to explore the area a bit. At the southern end of Ao Chao Phao, Laem Son lake is a great place to get a swim in freshwater under a backdrop of cool shady pines making it a popular place to cool off in the hot months. The west coast of Koh Pha Ngan plays host to the island's most diverse and interesting stretch of coral reef. There are more corals here than anywhere else on the island due to the south facing beach aspects and other conditions that make it so suitable for diving and snorkelling. From Ao Chao Phao to Koh Ma, there are dive sites at every beach, and virtually all of them cam be swam to making it possible for those on even the tightest budget to see the amazing undersea marine life that the west is so rich in. Due to the west's longstanding popularity, there is a great variety of restaurants and bars to cater for every taste, if you want to eat Thai, head to the village of Sri Thanu for cheap seafood, Isaan food and noodles; there's also a few restaurants serving top quality European foods in the region as well. If you fancy a night out there are some good bars on all of the bigger beaches. The climate here is also favourable, sheltered from virtually every angle, the west coast records the lowest rainfall on the island as the weather breaks on the north coast and the surrounding mountains. 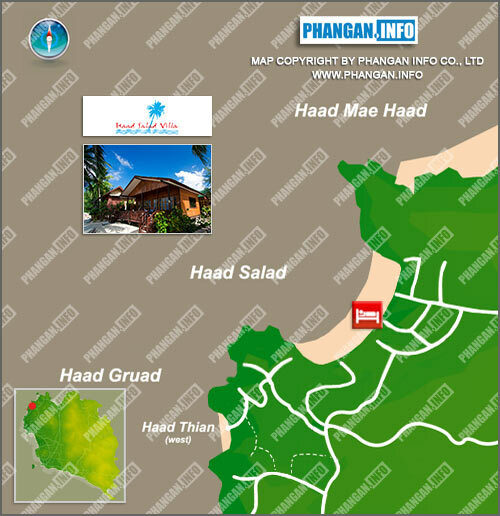 Haad Salad is situated on the west coast of Koh Phangan in between Haad Yao and the small island Koh Ma. It is about 15 minutes drive from the main port of Thongsala on a newly completed concrete road network. Haad Salad can also be accessed from the north via Chaloklum, a local fishing village. Taxis regularly go to Haad Salad from Thongsala.